Icky. They have destroyed the clean yet dirty balance of Vetiver in the original Guerlain and when they said extreme they certainly didn’t lie. Don’t mess with the classics. In a purely analytical sense, it is important to appreciate the composition of fragrance as something more than just personal opinion or in terms of personal wearability, but as a fragrance overall as an amalgam of linear oils and aromas to create new and innovative fragrances. Albeit, it is unavoidable for some opinion to come into play when studying a fragrance. In one case, I may like one fragrance more than another and I probably would give leniency to it if I were to review it. However, of course, this doesn’t become central focus when reviewing. The original Guerlain Vetiver is, according to my sources, a classic fragrance. It is the scent every man should smell at least once and every man should smell like. It is a ‘classic’ along the lines of Dior’s Fahrenheit; Chanel’s Egoiste; Creed’s infamous Green Irish Tweed; and more recently, Terre D’Hermès by Hermès. Therefore, Vetiver is a bit of a safe fragrance. It’s a common one even amongst those who do not consider themselves enthusiasts of / connoisseurs of fine perfumes, because of how safe and nonchalant it is. Guerlain’s vetiver is beautiful, and as with most old school Guerlain creations, they act as important pieces of reference work. In Vetiver Extreme, at first smell you are hit with vetiver and all of it’s ‘coolness’ with the sharp, overbearing twang of lemon and citrus. The officious verdancy of vetiver is best described as ‘rooty’ and is incredibly strong. The lemon note is unmistakably fresh and awakens the olfactory cells. However for me, these two fresh notes are quite a bit too powerful and has become obnoxious, not fresh. An egregious scrappy mess that has left the vetiver note for dead. The cool and rude vetiver is blended with the mellow heaviness of tobacco, pepper and nutmeg which provides the base notes which are earthy in character. The heavier notes in the accord are immediately recognisable from beginning to end. It has become dry to a level akin to a chapped leather bag. The liquorice and incense don’t help either. I can’t get over this perplexing character. It’s a shock to smell spice and cool at the same time, they fight it out and the aftermath resembles something like dry chapped lips wanting some lip balm. Cool vetiver and lemon mixed with harsh spice creates this contradictory fragrance that is always in opposition with itself; I just can’t enjoy it. The cut grass on a humid spring day note appears, but is so much more intense than it should be. The smell of cut grass itself is heady already, but this is just intense throughout. Vetiver and cut grass make for a nuclear bomb of green. Nutmeg, peppercorns and sandalwood also add to this effect. I much prefer my vetivers to gently hum in the opening and rise to power in the dry down. The cool opening and the peppery tinges throughout vetiver works marvellously in certain fragrances. Just not this one. In this particular case, the vetiver jumps into the party with bells and whistles, eats and drinks the food and leaves without ever uttering a single thank-you. It’s an unforgiving… unapologetic note of vetiver (on my nose). 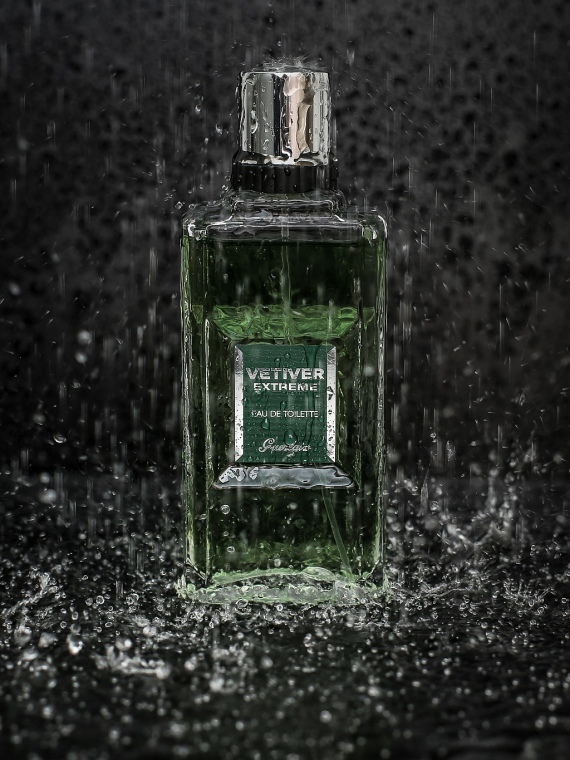 Guerlain’s Vetiver Extreme is a strong fragrance. Too darn strong. By all means this is not a bad fragrance… It just pales in comparison to the original and is a wasted opportunity. I will still question the vetiver’s audaciousness in the accord and the more than humble civet, cedar and the leather-esque notes that offer questionable qualities. It’s too much in between a fresh and a dirty fragrance for me to like it, just like everyone else has. It’s either one of another. oud or lime; fig leaf or vanilla; vetiver or lemon. Pick one as a main note, not both. Vetiver Extreme as a completed product is shaky and decrepit blend of heated disagreement. All in all, what I gather from Guerlain’s intentions is that this fragrance is supposedly a lifter of the spirit through its green quality. Unfortunately for me the only thing that is green is me after this. I was forced to scrub it off after 3 hours of testing – hoping and praying for a miracle through the mysterious drydown phase. It never happened. It’s just not indulgent enough, there is nothing there giving me a ‘wow’ or an ‘ohh’ in wonder and awe. No balance, too dry, and no shading; it’s a John Doe and not a Fabio. Alternatives: Tom Ford Grey Vetiver; The original Vetiver by Guerlain; Sycomore by Chanel; and Encre Noir by Lalique. This entry was posted in Guerlain and tagged Fragrance, fragrance review, Guerlain, Vetiver. Bookmark the permalink. I agree. It is such an “in your face” type of fragrance that you either have love for it or find it absurd. This fragrance isn’t really for me with it’s overly strong vetiver/grassy smell.